This is a super simple and delicious pork chop dish. You may make this pork chop for rice meal dinner, and even as filling of burger. I do not recommend this pork chop as western dish where you eat only the chop without rice as the sauce topping might be too sweet to taste without any rice to go along. This pork chop with honeyed tomato sauce complements steamed white rice very well. 1) Season pork chops with the listed seasoning. Combine well and marinate for at least 30 min. You may keep it refrigerated while marinating. 2) Break and beat eggs briefly. Mix well with seasoned pork chops and set aside. 3) Mash and coat mashed crackers with pork chops. 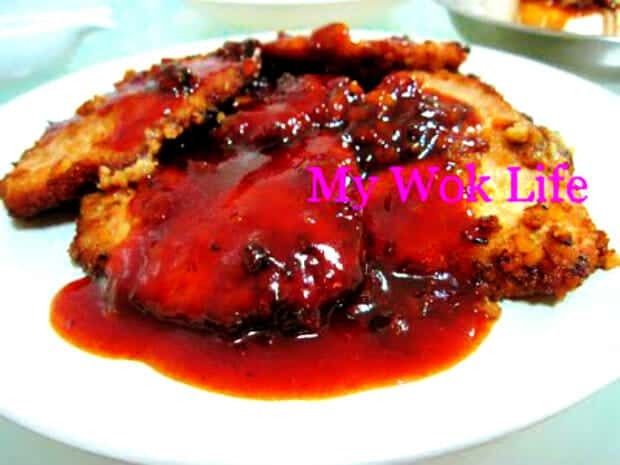 4) Heat wok with oil over medium fire, fry pork chops till crisped and golden browned. Drain on kitchen towel, and place on large serving dish. Reserve for later. 5) Remove excessive oil in wok and left only a little (about 1 teaspoon) will do. Heat oil with low fire, and add in garlic and stir fry till fragrant and lightly brown. Add honey mixture and stir briefly while heating the sauce mixture. When sauce appears light bubbly, heat off. Pour sauce over pork chops on the serving dish. Serve warm. Sauce topping should not be too much as it might taste too sweet and over-whelmed. A slice of honeymato pork chop counts about 260kcal. Tips: Add 1 tablespoon of water into honey and ketchup sauce mixture, if find it too thick. * For even softer meat texture, sprinkle some meat tenderizer onto the pork chops before frying, if desired. Hi there..we tried your recipe today and would like to tell you that it turned out great. I went on to look at your other recipes and WoW…it all looks so good. Have u joined my facebook fanclub? I have some exclusive infor there for my readers, sometimes.. Check it out.